The eccentric is one of the few parts we can date accurately using the Meccano Magazine. It was suggested twice in quick succession, first dismissed in January 1921 ("There are several ways of making an eccentric with existing parts"), and again in the March 1921 issue, when it received the slightly warmer comment "This part would be very limited in its application but... we shall take the eccentric into consideration". Lo and behold, by the July issue of the same year the part was announced! There must have been something of a turnaround, because by April 1924, "Spanner" claimed that "No. 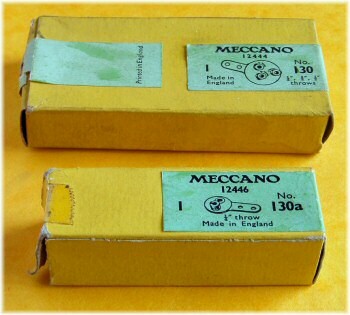 130... is one of the most useful of all Meccano parts"! Many Meccanomen are intrigued by the workings of this mysterious part, which is certainly odd at first glance. The mechanism becomes clear when we dismantle one by removing the bosses, as below. An inner (unpainted) section is tightly clamped between the two outer faces by the three fixed bosses. The only moving part consists of a short strip attached to a circle, trapped between the outer faces; this part is slightly thinner than the fixed inner section, allowing it to rotate freely. The things I do to make these web pages! 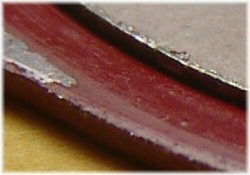 The red parts in this photograph are similar in thickness to a standard strip (around 0.83mm or 0.033''), but the central disc is 1.22mm or 0.048''. It also appears to be made of a much harder and surprisingly shiny steel, quite unlike other Meccano parts, at least in this 1950s example. Note that the holes in the two outer faces are not perfectly circular – they have two fractionally wider sections each to help prevent the bosses from rotating. The Triple Throw Eccentric was joined by the "Eccentric, ½'' throw" in 1928 (part 170), and soon after that it was renamed to "Eccentric, Triple Throw". In 1945, the new part 170 was renumbered to 130a, to be next to its bigger brother. Eccentrics were initially only available nickel plated, of course, but they continued in this finish until 1929. Many small parts, including sprocket wheels and eccentrics, didn't join the ranks of coloured Meccano until 1930. They made up for it by becoming one of the few Meccano parts to appear in a combination of red and green! Other parts sharing this honour (for example, 3" pulleys and spoked wheels) didn't last long, but dark red / green eccentrics are not uncommon. Triple eccentrics in particular appeared in pairs from outfit 4 (later G) upwards, although only one single eccentric was supplied in the outfits 7 and L from 1930. In nickel and dark red / green, then, the triple eccentric is a pretty common part and the single eccentric a rare one. In 1937, with the advent of outfit 10, a pair of each were supplied. In medium red and later colours, therefore, they are fairly common parts, and their limited use means that there are generally more of them than are needed! The stamping changes between the nickel plated and the coloured versions of the Triple Eccentric. The word Throw on nickel eccentrics changes to Stroke with the advent of the dark red / green variety. From pictures received to date, and messages on this page, we have I think established that the changeover happened soon after the change to red/green eccentrics in early 1930. A very small number of red/green eccentrics are found stamped Throw, but the vast majority are stamped Stroke. It is possible to find nickel-plated eccentrics with the later Stroke stamping, but these are most likely special-order parts. Remember that it was possible to order a larger outfit with nickel-plated parts between 1930 and 1941, which would have contained specially finished but current parts. French ones, of course, aren't stamped in inches. The three bosses are stamped 6 millimetres, 12 millimetres, and 18 millimetres, including those supplied in the UK from 1985 to 1992. It's possible to find the odd eccentric without a stamping. Although the parts of the eccentric are 'handed' (because of the layout of the three holes), the two outer faces are identical except that one is stamped and one isn't. It would be easy to transpose these outer faces, leaving the stamping hidden inside the part. 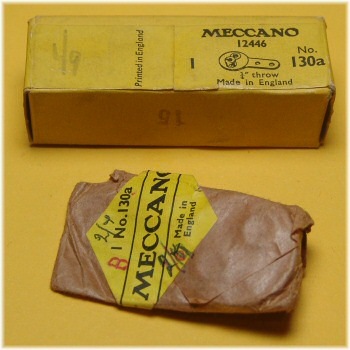 In fact, since we find unstamped eccentrics very rarely, Meccano must have been careful to assemble these parts with one stamped face and one unstamped, facing the correct way. It's a little surprising that they didn't simply stamp all the outer faces, making them identical, and making assembly simpler. It's possible that this was done in the French factory, as the metric stampings can often be found on the 'boss' side rather than the 'peened' side. To the right are a pair of dealer packets for part 130a, the single eccentric. The top box has a part number and so dates from betwen 1954 and 1957 (after 1958 the label would be light green). The lower part is earlier, probably around 1950 judging from the sharp-cornered diamond. To the left is a picture of two later spare parts boxes, dating from the light red/green period. The parts in these boxes are light red, indicated by the light green label. Note: I'm guessing here for the date of the double-tapped nickel eccentrics, and for the nonexistence of the single-tapped single eccentric. I will no doubt be corrected in short order. Also, I'm pretty certain most examples in L outfits were medium red, but I might be wrong. The blue example of the triple eccentric (part 130.nb above) is from a 1933 outfit 3a, which we might have expected to have the lighter red/green colours. Total number of messages on this page: 21. This is page 1 of 4. Patent 177430 does not seem to be a US patent - perhaps UK? The US patent for the eccentric (part 130) is 1412117, applied for 31 August, 1921 and issued 11 April, 1922. I would say 1930-1932, if you check out the photo of the Part 170 (single eccentric) in the list above - it also shows the same Patent No. I have a bright Nickel plated version marked Patented in USA April 11th 1922 also stamped MECCANO and single tapped [presume you refer to the number of tappings on each hub]. Surely all the faces were stamped on the same side. Since they are "handed" when two are assembled together one would have the stamp outside, the other would have the stamp inside.